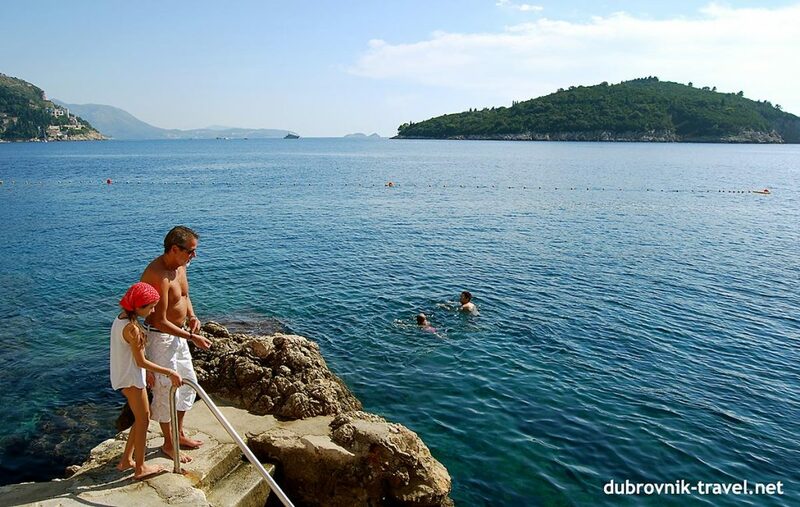 Buža Beach is, in my opinion, one of the most attractive swimming and sunbathing spots in Dubrovnik. It is a pretty unconventional place, located right next to the southern edge of huge Town Walls, offering great views of Lokrum Island and Adriatic. 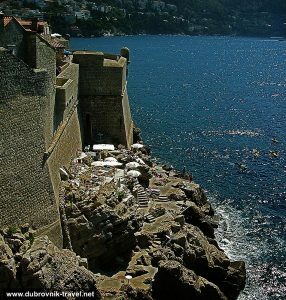 The beach is rocky with numerous patches of concrete terraces where you can sunbath and jump into the sea. For refreshments, a nice little café-bar is also there, recently becoming very popular with Dubrovnik’s visitors. The views from Buža can’t be beaten, especially at sunset when the whole horizon becomes orange and red. Buža is a perfect place for a relaxing visit to the beach, especially if you combine sightseeing and swimming in one day as its location is in the very centre of Old Town. The only way to access Buža is to pass through the hole in the town walls (hence the name – > Buža in Dubrovnik’s dialect means “The Hole”) and down the steps to the cliffs. Note – There is no access for disabled visitors. My tip for enjoying Buža: Due to its location, Beach in Buža could be very windy at times as it suffers (or enjoys) Maestral as well as Šiloko winds. Therefore for summer periods, I suggest you go for a swim at Buža in the mornings, before Maestral wind starts. At that time the sea is calm with almost no waves. Afternoons usually brings wind, so the sea there becomes rougher and swimming is less pleasant. From Boninovo / Lapad / Babin Kuk – take bus no 4 or 6 to Pile, walk to Stradun, near Onofrio’s Fountain turn right in Ulica od Puca street, get up the Jesuit Stairs and another two minutes walk you are there.